“Do you swear that the evidence you shall give shall be the truth, the whole truth and nothing but the truth, so help you God?” This is the oath most often taken by witnesses in Canadian courts who choose to swear a religious oath before they testify. As they swear the oath, the witness will be asked to place their hand on the religious book that binds their conscience, most commonly the Bible. Everyone testifying in a court case must promise to tell the truth, but in Canada today witnesses are not obligated to swear an oath on the Bible. They may swear a religious oath on another book of faith or make a ‘solemn affirmation’. In the past Canadian courts saw some unusual forms of oaths. This eNews explores the variety of oaths that have been sworn in BC courts and the modern alternatives. A witness may swear an oath on the holy book that binds their conscience. BC courthouses are equipped with Bibles and may have other books of faith, depending on the location. People whose consciences are bound by a holy book other than the Bible may swear an oath on that book or they may affirm - make a non-religious promise to tell the truth. If a person wishes to take an oath on a book of faith other than the Bible they should speak to the lawyer who will be calling them as a witness. The lawyer should enquire whether the Court Registry has the desired book, and if not, make necessary arrangements to obtain the book and bring it to court. If a special oath will be required, the Court Registry should be notified at least two weeks in advance so the Court Clerk can be prepared and obtain the trial judge’s authorization to administer it. If a lawyer is not involved, a witness who wishes to bring their own holy book or use a different form of oath should tell the Court Registry about it at least two weeks before the trial. It is good practice for lawyers to find out whether their witnesses wish to swear or affirm and let the Court Clerk know as the witness is being called to testify. If this is not done, a witness will be asked whether they wish to swear an oath or affirm after they enter the witness box. Note: after swearing an oath or affirming, a witness will be asked to “state your full name and spell your first and last name for the record.” If a witness is also asked to state their address and they prefer not to make it public, they can tell the judge they do not wish to say their address aloud. Online research reveals the origin of oath-taking is not clear because it pre-dates recorded history. However, there is evidence that ancient civilizations in the Middle East swore oaths using divine symbols. In ancient Egypt people swore by their lives and “ankh”, the word for oath, meant “an utterance of life”. Romans, Greeks and Germanic tribes all swore oaths – often by their swords or other weapons that symbolized the god of war. 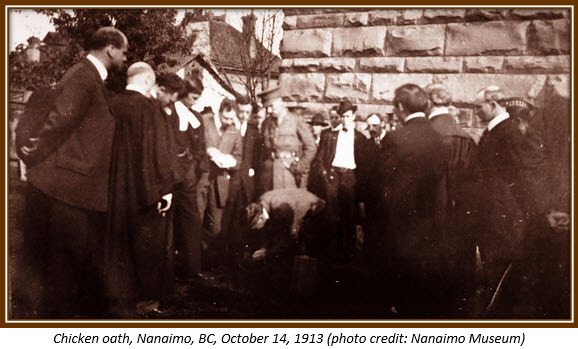 In the more recent past, colourful oaths have been sworn in BC courts, reflecting a witness’ religious beliefs or country of origin. For example, the Candle Oath involved a witness placing their right hand over a lighted candle placed on the ledge of the witness box, and saying, “I will tell the truth, the whole truth, and nothing but the truth, and if I do not may my soul be extinguished as I quench this flame” before extinguishing the candle. Another oath required the witness to write their name on a piece of paper and burn it, swearing that their soul would be consumed by fire like the paper, should they not tell the truth. The Saucer Oath involved a witness kneeling and striking a china saucer against the witness box, before declaring that if they did not tell the truth their soul would be cracked like the saucer. The Chicken Oath was even more elaborate, involving lighting candles, decapitating a chicken, and burning a signed oath in the candle flame. Another form of oath incorporated religious symbols of bread, salt and water rather than a holy book – and some BC courthouses kept a tray stocked with these symbols on hand and replenished them from time to time. Steps have been taken in other provinces to facilitate use of an eagle feather when taking an oath or affirmation. The Provincial Court of BC is open to exploring a similar initiative in this province. Courts understand that in our diverse society witnesses will have a variety of religious traditions and non-religious beliefs. What is important is that a witness’ promise to the Court to tell the truth binds their conscience. Whatever form that promise takes, it is a commitment to tell the truth. A witness who does not tell the truth can be charged with perjury and if found guilty, they can be sentenced to jail for up to 14 years.